The IIT-JEE reforms sought to be introduced by the human resources development ministry have sparked a national debate in India. While the HRD ministry states the new exam pattern is an attempt to curb students' over-dependence on coaching classes and to bring some respectability to the board exams, coaching classes and a section of students question the need for introducing the reforms in the middle of the academic year without prior warning. This year, about 198,000 students appeared for 4,935 seats at the seven Institutes of Technology; the Institute of Technology-Banaras Hindu University; and the Indian School of Mines, Dhanbad. In the wake of these reforms, Professor V G Idichandy of IIT-Madras discusses with Yogesh K Upadhyaya, the reasons for a change in the IIT-Joint Entrance Examination pattern and the eligibility criteria. 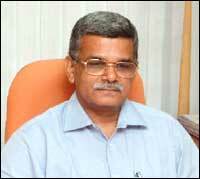 Prof V G Idichandy, convener of STF was the chairman of JEE, IIT-Madras in 1999. He is currently a professor in the department of Ocean Engineering at IIT-Madras and the dean of students. In February 2004, the directors of IITs decided to set up a special task force to recommend reforms for the JEE. Prof Idichandy was the convener of the Special Task Force. Being JEE chairmen at different times, all the STF members were aware of the issues that needed to be sorted out. Could you explain the changes proposed in IIT-JEE pattern and eligibility criteria for appearing in the exam? JEE will continue to be the sole criterion for ranking the students for admission to IITs, IT-BHU, ISM Dhanbad and other participating institutes. School results will be factored into the admission process for the IITs. Only those students who secure a first class or equivalent in the plus-2 examinations will be eligible for admission to the IITs. For students belonging to SC/ST there will be a relaxation of 5 per cent of marks below the level of marks prescribed in the respective examination. JEE will be a single objective type examination. The question paper can include short write-up on a topic in physics, chemistry or even mathematics followed by objective type questions that are based on the write-up. A student can write the JEE in the year in which he/she passes the XII standard examination and/or in the following year. Those who join any of the IITs, IT-BHU, and ISM Dhanbad through JEE-2006 will not be permitted to appear for JEE in the future. The procedure will be reviewed after JEE-2006. A one-time exception would be allowed for those who passed their qualifying examination in 2005 or earlier. What prompted the expert panel to change the pattern of exam, from two stages (screening and main) to only one-step exam? The committee which suggested the screening test ('98 and '99, JEE committees) recommended a review of the examination system after five years. The screening test is a test of the aptitude of the student while the main examination is a test of his/her analytical ability. We have completed six JEEs after this system was introduced. The IIT system is convinced that an objective type examination can be designed to test both aptitude and analytical ability. Based on this the special task force recommended a comprehensive objective test over a two stage examination. We must keep in mind that clearing JEE is not an end in itself but it is meant for the very limited purpose of selection of students to an academic programme. There is a restriction on appearing for more than two times in the exam. There is also a restriction on appearing again, if someone has secured a seat at any of the seven IITs, IT-BHU, and ISM. Why? The main reason for adopting these two measures is to provide a level playing field for candidates appearing for JEE. Now the JEE stipulates a first class in higher secondary school as the minimum eligibility requirement. Are we justified in allowing candidates with additional years of preparation to take the exam along with fresh students just out of the school? The candidates appearing two or three years after leaving the school get additional time for JEE-specific preparations, have an altogether different mindset and approach to life and education, when compared to those directly out from the schools. Two or three years of intensive preparation in specific subjects does not make these candidates any wiser as the training is more to beat the examination rather than for the pleasure of learning. More or less the same reason is valid for those who have already joined the IITs. In addition, they deny opportunity for others who would have gained entry into one of the IITs. There were protests in New Delhi and other cities. Why didn't they protest when the main exam-type pattern was changed to two-stage exam (main plus screening) exam in the year 2000? In the last six years, the IIT system has received much more visibility and recognition. Many students and parents believe that an IIT degree is a passport to success and fame. Those who prepare the students for JEE at astronomical costs, exploit this attitude or misconception to their advantage and would like a predictable, easily recognizable pattern for JEE, and are scared of changes. I don't believe that the stage-managed protests in some cities were done by students. It does not require much research to identify those behind the protesters. Just like any other unjustified protests, agitation against changes in JEE has been instigated by people with vested interests. The students and their parents should realise the fact that there are equally good/better opportunities outside the IIT system. How will a two-tier system help students? The two-tier JEE tests the aptitude of students for professional education through a screening test and their analytical ability through the main examination. Many a time the parents decide what their children should study. We have come across students who get admission because of rigorous coaching. Later, they struggle to complete the programme as they have no aptitude for an engineering education. We feel that one way of countering this situation is by allotting branches of study at the end of second or third semester and not at the time of admission as practiced today. Such a procedure will give the students enough time to study various options available to them and choose the branch most suited to their aptitude. I hope the IITs, in due course, will look at this suggestion seriously. On the requirement of minimum 60 per cent marks in the XII board exam, critics argue that different boards give marks in different ways. For instance, CBSE is considered lenient in grading, while it is relatively difficult to achieve first class in some boards, such as Uttar Pradesh and Bihar. Also, one of the high school boards in eastern India immediately announced the plan to grade the XII standard exam liberally, so that no one from the state is denied admission to IITs. How will you counter this? Ideally, normalised scores of the different boards should be used. With about 40 school boards in our country, collecting results, arriving at normalised scores, and above all, convincing the stakeholders of different eligibility marks for different boards are all Herculean tasks -- next to impossible, in fact -- considering the time factor involved. First class (60 per cent) in a qualifying exam is much more simple, easily understood and accepted. Though the STF recommended normalised scores, the Standing Committee of the IIT Council (SCIC) which includes the directors of the IITs as members decided on first class in higher secondary as minimum criteria and we saw a lot more wisdom in that approach. Our aim was to give adequate importance to school education in our country. We are extremely happy that all the school boards whole-heartedly welcomed the move. Don't you think the timing for the announcement of reforms was wrong, as many students have already enrolled in coaching classes, and they are in the middle of an academic year in high school? IITs cannot introduce reforms in JEE for the convenience of those in the coaching classes. The invariant pattern of the entrance examination of the premier institutions made possible the mushrooming of coaching institutions. They grew because of the demand for quality higher education, seats for which are too few in our country. Now it has reached a stage where genuine students with raw intelligence and aptitude armed with the knowledge gained in schools find it difficult to compete and gain admission to the premier institutions. The main target is the student presently in the XII standard or equivalent ready to take an examination, irrespective of the pattern and with all its surprises. Every year JEE is announced in the month of September. This year was no exception. Eligibility requirements and the type of examination are always explained in the information brochure included along with the application form. It is reported that over 95 per cent of the students who clear IIT-JEE, have joined coaching classes. This is an unusually high number compared to other national-level exams, such as AIEEE. Why there is a rush for this exam? How will the new reforms help curb the coaching class dependence for an IIT-JEE aspirant? I have already explained the reasons for the rush for JEE and the consequent enrolment in coaching institutions. We are convinced that the present reforms in JEE will reduce the necessity for additional preparation. IITs should be allowed to conduct JEE 2006 with the present reforms to prove the point. If the panic reactions witnessed in some cities where coaching centres are concentrated are some indications, the IITs have already won the first round! Please tell us more about IIT-JEE; when it was introduced and why it has an objective format. JEE has a long history. It started in the early sixties and evolved through years. There were changes of various sorts over the years. For instance, English was a compulsory paper once upon a time. Later, English, though compulsory, was not in the reckoning for deciding the ranks. Questions in Hindi and an option for answering in Hindi and regional languages were introduced during eighties. Objective type questions were a part of the JEE for some time. Screening tests also went through metamorphoses before the present pattern was adopted in the year 2000. JEE is well known for its credibility and the IITs consider JEE very sacred and are very proud of its autonomy. IITs take extra care and precautions to keep the credibility intact and the faith of the general public and students in the JEE system notwithstanding the incident in 1997 that shook the very foundations of JEE. But with the strong support of the ministry of HRD, IITs outlived the threat and restored all that was lost within a short time. The whole country recognises the independence of JEE and importance of IITs and that is precisely why anything about IITs receives so much public attention. This public audit makes us more responsible and to perform better. Don't you agree that school education has faced a setback with students concentrating more on how to crack the entrance tests? Yes, school education has become a big casualty, as there is no credit for twelve years of schooling for admission to the institutions of higher education, be it state-run or central. (Tamil Nadu is perhaps the only state, where equal importance was given to both school performance and entrance test for admission to professional courses. Though the TN government announced admissions to professional courses based on school results from 2005, because of the procedural issues, it was not implemented). Why should anyone take school education seriously, when admissions to higher education is based on one entrance test and the eligibility for admission to national institutions is a just a pass in qualifying examination? Under such a situation, it is but natural for a student to spent time preparing for entrance examination rather than in the school. What changes do you foresee once these reforms are implemented? The measures recommended to reform JEE will pave the way for visible changes in the attitudes of students to the school education. When JEE questions are of the level of XII standard, students and parents will realise the futility of going through the rigours of coaching institutions and neglecting school education. We also feel the rural students and girls will benefit from these reforms but only the future would tell how far we are justified in making these assumptions. Girls constitute only 8 per cent of the student population in IITs (IIT-Madras taken as reference). But school results show better performers are girls, so this could be the beginning of a new trend.